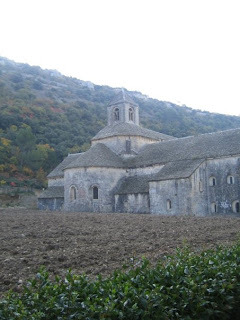 This morning we went on a fieldtrip to Abbaye de Senanque, an abbey that is still used by monks and freres. They live there spending big parts of their days praying and also working. 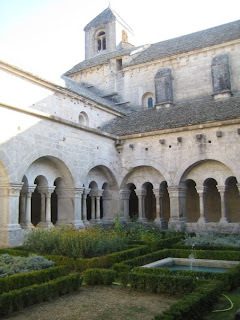 The monks grow lavender and tend honey bees for their livelihood and they sell lavender products and honey in their store. 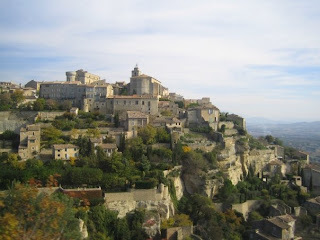 All of the fall colors were out once again and we passed this awesome town on the side of a mountain called Gordes. We spent the afternoon fabric shopping at Tissus Gregoire and because today was Lexi's birthday, we had cake and a dance party tonight! Today we turned our cafe into a pumpkin carving factory for little french children. This is the most Halloween they get since they dont really "celebrate" Halloween in France. They LOVED it. They were so happy and so smiley and it made me so happy and so smiley. They are so cute! I know that French is their first language, but I am always amazed by little children speaking languages that I want to speak. On Halloween there will be trick or treating, a haunted house, and thriller dancers along Rue de Four. Look at this pumpkin! Its a french jack o lantern! So great. Bonne nuit! Today was just a beautiful day. The winds have stopped, the sun is out, and the colors are changing! 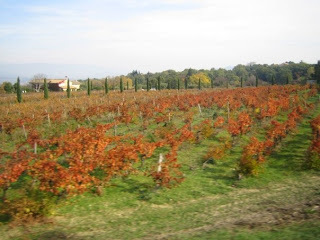 Now when you look out to the valley each vineyard and field is a different color than the one next to it! Its gorgeous. I only have three more weeks to enjoy this view. We are preparing for Vernissage and it is going to go quick. Before I know it my mom is going to be here and I am going to be traveling again. And then its back to the US for the holidays. How lucky I am. A random side note... today while eating the pretzels I have had for a few weeks, I noticed that they are actually called "Bretzels." Who would have thought. Night! Day 3 was Kara's 22nd bday! It was also our day for group shopping. Really. The fibers girls were split up into groups of 3 or 4 and each chose a store to go to from these books. We then had to navigate around and visit them, and buy things! My favorite store was this cute one called Au Petit Bonheur la Chance. It had amazing antique trinkets and lots of great finds. After shopping Kara and I found the cutest cafe. Kara got a croissant that melted her fork! It was ok because the cafe was so cute. I finished the meal off with a yummy chocolate tart! The afternoon was all about FIAC, the contemporary exhibition we attended at the Louvre and the Grand Palais. It was interesting, there were some nice pieces and some that were just weird. Each artist had their own gallery space with their work in it, it was at times a little overwhelming, but overall it was a good experience. After FIAC Janelle, Kara, and I walked down le Champs-Elysees to the Arc de Triumph. After seeing all of that we made our way back to the Latin quarter and went out for amazing sushi for Karas bday! It was so yummy and so much fun. We ended the night at an English pub for a glass of cider, all in all it was another good day in Paris.